Kroll’s slide was part of a 3rd World Conference on Research Integrity talk he gave on his office’s investigations into allegations of misconduct. The 3rd WCRI — the first was in Lisbon in 2006, and the second in Singapore in 2009 — gathered international leaders in research integrity for three-and-a-half days. For example, David Wright, of the U.S. Office of Research Integrity, spoke on the incredible lengths — think faked emails — that researchers will go to hide the evidence of their fraud. And Nature executive editor Véronique Kiermer discussed the troubling and growing trend of “sloppiness” she and her colleagues have seen. Sorry, didn´t get it: what´s to do with the bird vocalizations? The fifth excuse is the one I see most of times. Another one quite common relates with the amount copied: many claim just one sentence/paragraph (from each author) copied is not really plagiarism. I’m visualizing the writer sitting by the window, being harassed by a flock of crows…or pigeons, or sea gulls vocalizing in Hitchcock fashion. Ivan, the Moon case was fascinating. Thanks for sharing it at the conference. I notice the “only introduction or background” reason was first on the list. 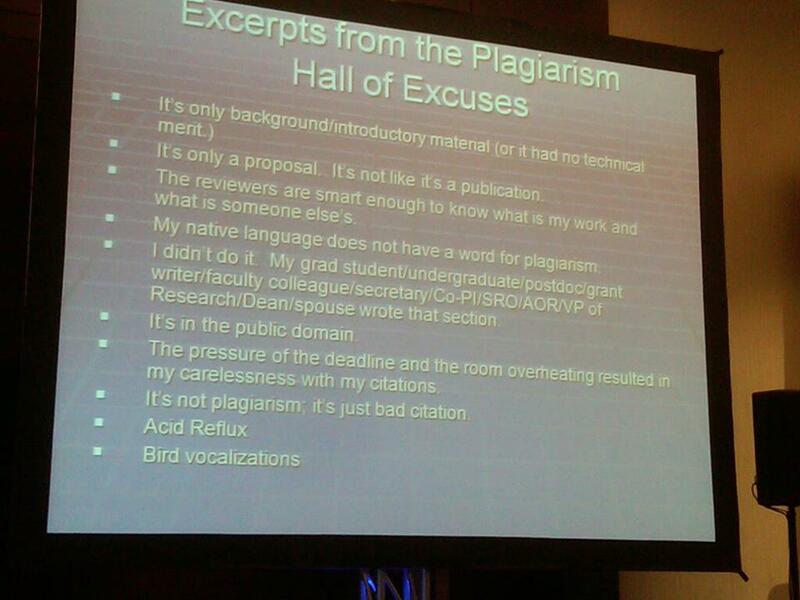 B) Interprets misconduct policy categorically that introductory sections don’t count for plagiarism or falsification. Substantial unattributed textual copying of another’s work means the unattributed verbatim or nearly verbatim copying of sentences and paragraphs which materially mislead the ordinary reader regarding the contributions of the author. ORI generally does not pursue the limited use of identical or nearly-identical phrases which describe a commonly-used methodology or previous research because ORI does not consider such use as substantially misleading to the reader or of great significance. Maybe there should be accepted practices about how to reuse text in an introductory or background section, when it’s obvious it’s not claimed to be new, and just included to make the study more accessible to people who are not aware of every relevant context of the domain, whilst of course acknowledging properly where it actually comes from. I’ve gone to the conference website and I still don’t know if this is the 3rd instance of the “World Conference on Research Integrity” or a conference on research integrity that has something to do with the “third world”. A very enjoyable set of slides! Miss Labeling is Miss Grouping’s older sister and they have worked in a number of labs around the world. So why the focus on the third world? Well, now that this is the second comment to confuse the Third World – at least this shouldn’t be as much of a problem with subsequent meetings, one hopes. The use of 3rd, as opposed to “Third” should have made it clear….